In this article, i’ll show you how to make these DIY Wooden Drink Coasters complete with 4 wood coasters and a coaster holder in just a couple hours of total work. 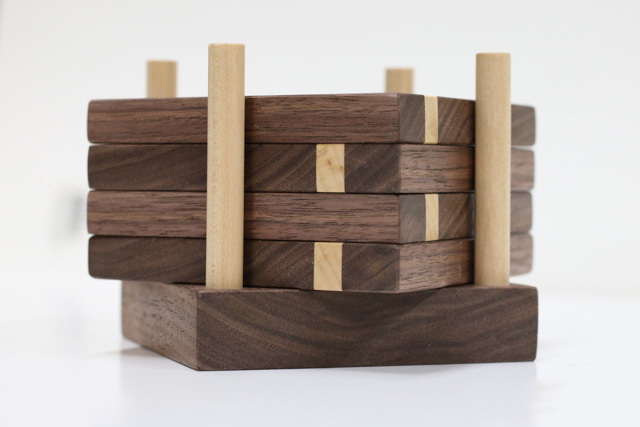 This walnut and maple wooden coaster set makes a great gift. 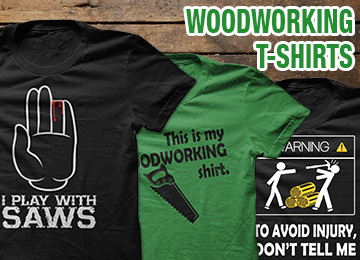 They’re also good for protecting the side table, nightstand, or desk you spent so long making. 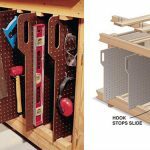 With just a miter saw and a drill you can make a basic version. 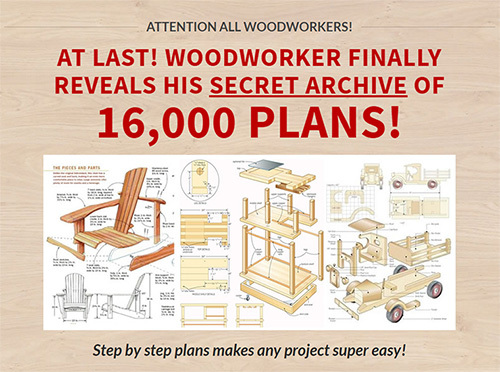 Add a tablesaw and planer into the mix and you can have a designer coaster set like this one. These beverage coasters are made from walnut with a stripe of maple for a little flair, but you can really use any wood you want. I’ve seen several done in reclaimed pallet wood and they look great too. So don’t look any further for the perfect handmade gift. 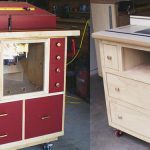 Before we get started, make sure to follow us on Facebook and Pinterest to keep up with all my latest builds and free projects! We’ll start with the coasters and the base. You’ll need 4″ of material for each coaster, so since I wanted 4 coasters I needed 16″ of material. I grabbed a 16″ piece of walnut and found a little longer piece of maple to use as an accent. The smaller piece on top will be for the base and just needs to be bigger than 4″x4″. 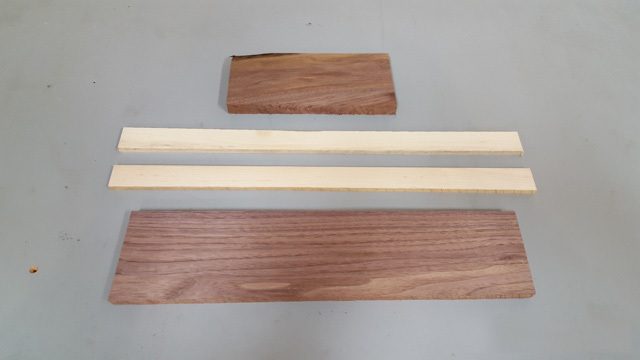 The accent strip of maple will be 1/4″ wide. 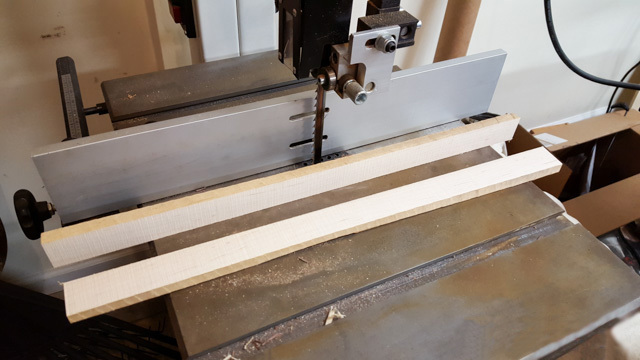 Cut the maple to size on the bandsaw like I did or use a table saw. 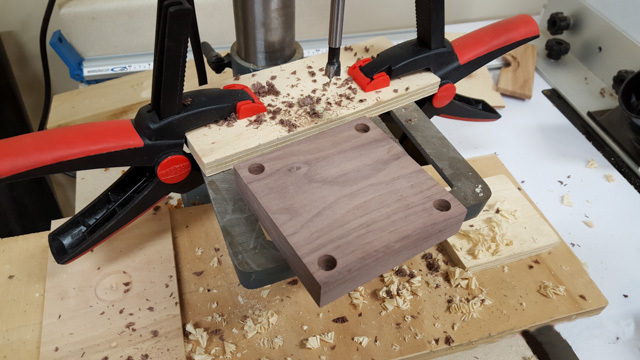 Run all the pieces through the planer to get the walnut coaster blanks down to 1/2″ thick, the maple down to 1/4″ thick and at least 1/2″ wide and the base to 3/4″ thick. 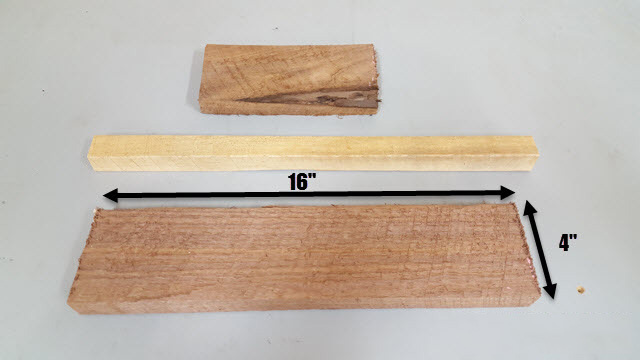 Rip a 1/2″ strip off the edge of the walnut coaster blank and rip the maple strip down to 1/2″ for a 1/2″ x 1/4″ piece of maple. 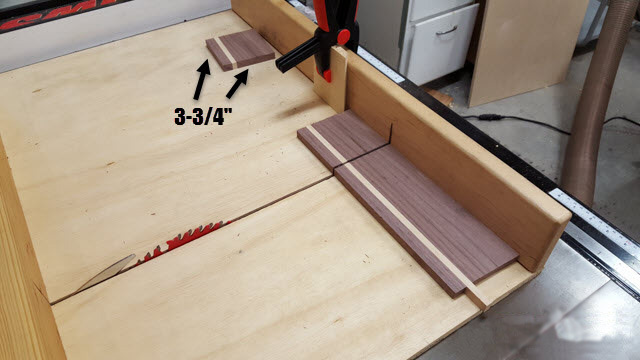 I use a 50 tooth combination blade on my tablesaw and it works great for both ripping and crosscutting duties. 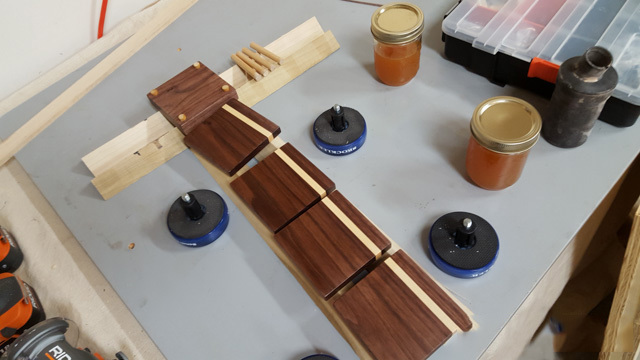 Now put the maple between the walnut and glue and clamp the pieces together. 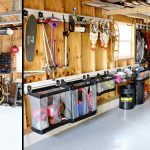 I used a combo of f-clamps and aluminum bar clamps, but even quick clamps would work. You don’t need much pressure here, just enough to get some good glue squeeze out. 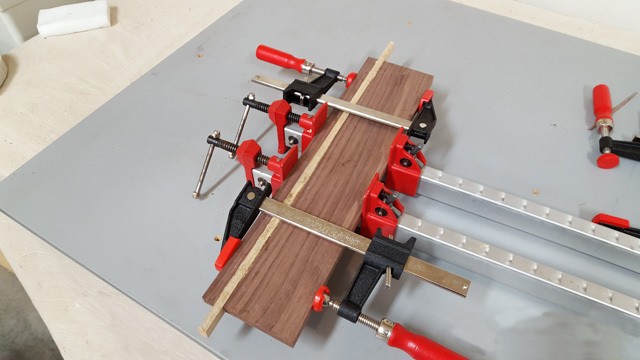 Let the glue dry overnight then remove from the clamps and run the blank through the planer. A few light passes will get everything even. The final dimensions for the coasters and base are 3-3/4″ square. 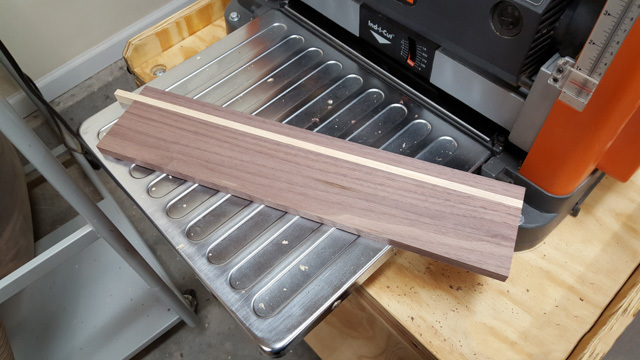 Rip the blank to 3-3/4″ wide, taking the material off the larger walnut side. Then use a crosscut sled or miter saw to cut the 4 coasters and base to final size. 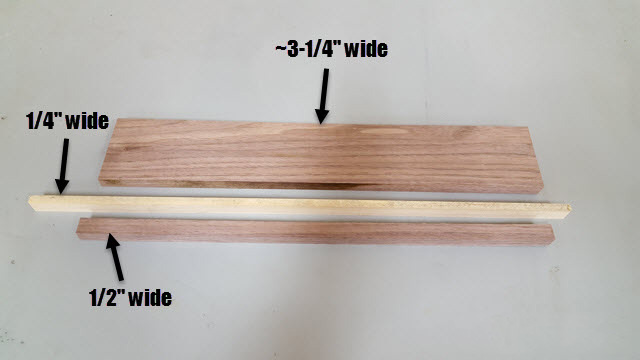 Cut 4 pieces of 3/8″ maple dowel rod to 3″. These pieces will go in the holes you just drilled. Sand all the pieces to 220grit and soften the edges with the final grit. Use 2-3 coats of polyurethane to seal the wooden drink coasters and keep them protected against liquids (party fouls). 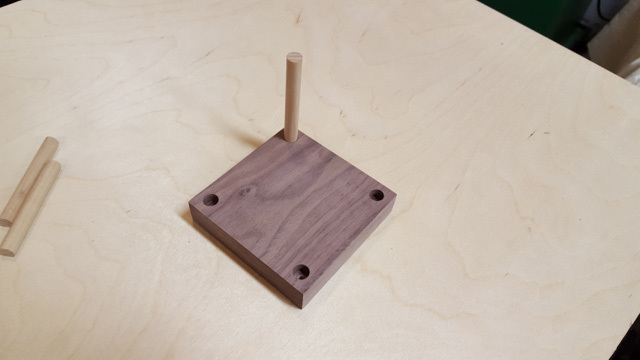 I used small pieces of dowels sanded down to just under 3/8″ diameter to plug the holes of the base while applying the poly. This keeps the finish from going into the holes and interfering with the fit of the dowels later. 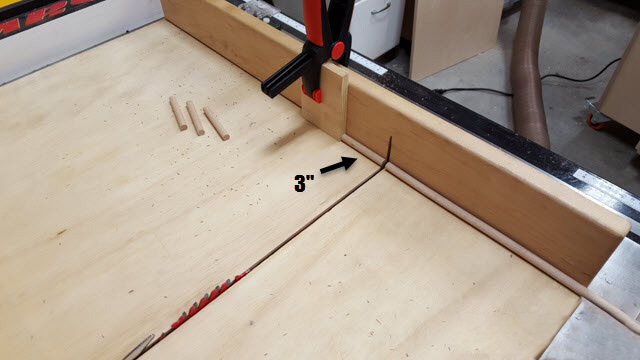 Install the dowels into the holes of the base and secure them with a drop of CA glue. 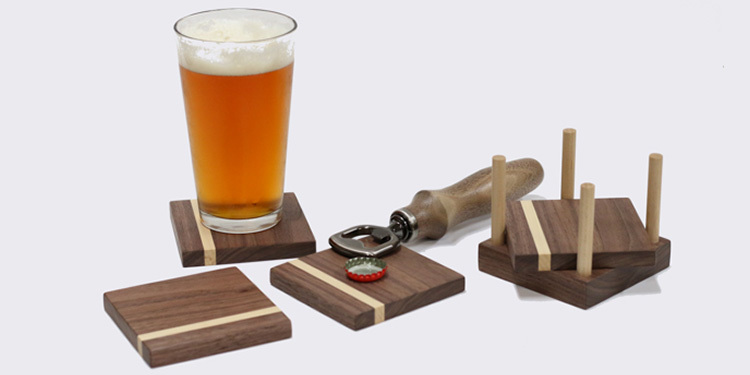 Now go enjoy a cold one with your DIY Wooden Coasters protecting your table from water stains!